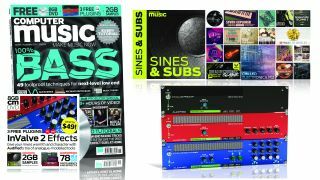 In this special issue of CM, we’re going lower than ever before, with a whole issue dedicated to the art of bass design, production and mixing. This month’s tutorials, artist videos and expert columns are all focused on giving you the knowledge and ammunition you need to truly rule the low end of any track. It all starts with the right source sounds, and across this feature, we’ll show you how to craft, shape and sculpt those woofer-shaking bass sounds you’ve always dreamt of. We’ll cover everything from basic bass science, through newfangled ROMplers and legendary synths, to modern sound design techniques, all in pursuit of the best bass and sub sounds around. Check out two of the videos here, and get loads more with CM249! Across three huge in-studio videos, we’ll show you the secrets of bass mastercraftsmen – Break, InsideInfo and The Vanguard Project (aka BCee and Villem) – exposing their production techniques and wisdom across a total of 3 hours and 30 minutes. To watch the full videos, grab your print or digital copy of Computer Music 249, and watch the first half of each vid on CM’s YouTube channel. See these three formidable mixing effects in action in the video, get the full spec over on the InValve Bundle page, and check out Audified’s other plugins on their official website. See one of the videos here, and get the rest with CM issue 249. This 500-strong pack of woofer-worrying WAVs is crammed with kicks, analogue subs, tone drops, bottom-heavy FX, hard-hitting bass loops and much more. Get this exclusive collection of sounds only with this issue of CM!